Has fantastic parts, but isnt the sum of them. Wait for the inevitable remix version, which may fix some of the problems. Crossover fighting games are often just about the characters – WHAT will HAPPEN when TWO worlds COLLIDE and so on. Rarely are they true crossbreeds like Street Fighter X Tekken, a game that takes the peerless Street Fighter IV as its base but adds a huge Tekken character roster and key mechanics from Namco's series. Most Street Fighter games have eventually found their way to the PC, but we've been largely spared the winding history of Tekken. There are two key differences, which Street Fighter X Tekken has a real go at bringing together. The first is that in Tekken each button maps to a specific limb on the fighter, as opposed to Street Fighter's six-button system of light, medium and heavy punches and kicks. The second is the importance of 'juggling'. In Tekken, when an opponent has been hit and is in mid-air, you can follow-up with attacks that can't be blocked and will end only when that victim hits the ground. Keeping your opponent in the air can be tricky, but it's always possible to tag a few extra hits on. It's a more fluid system than Street Fighter's more rigid hierarchy of combos. There, a snappy input pulls off a devastatingly smooth series of moves. In Tekken things are a bit messier: there are fixed high-damage combos, but it's possible to interject other moves, especially when your opponent's not fighting back. This finds its way into X Tekken in a brilliant way, one of the game's shining successes, as the ability to combo from any low-damage attack into any higher-damage attack. For example, light kick into medium punch into heavy kick will produce a combo using any character, providing you get the timing right. Not only that, but this system is the basis of tagging in and out properly – which we'll come to in a second. First, the rules. Street Fighter X Tekken is a 2 vs 2 fighting game, with two fighters on screen at once and the ability to tag your team members in and out. Both fighters have their own health bar, which recharges to a degree when they're off-screen, but the first knockout on either team decides the round. Learning when to tag in and out is by far the most important trick in the early stages of SF X Tekken. Although there's a button combination for a straight switch, it leaves the incoming fighter vulnerable for a split-second and usually means eating a mega-combo. The name of the game is switching mid-combo, which sounds complex but is easy thanks to the ability to combo into higher-damage blows. If you execute a combo with the strength of blows ascending, the last blow will be a heavy launcher attack (fighting jargon for 'knocks them into the air') and after it hits the characters instantly switch out – and the incoming fighter, if swift enough, can start juggling the airborne opposition. In full flow Street Fighter X Tekken can turn up some incredible fights. There are back-and-forth grudge matches ending in Super combos, blood-and-thunder offensives that bully opponents to death, and knockdown- drag-out wars of attrition where the final blow is a light tap on the ankle. Sometimes whole flurries are exchanged without anything breaking at all, both fighters pirouetting away from the maelstrom in a brief second of calm before charging headlong back in. More than anything else, it's about team play, with the fights constantly punctuated by character switches. At its simplest this means launching an enemy when low on health, and storming in with a charged-up dragon punch. Often it can be used mid-combo, if you can manage some extremely tight timings, to pull off ridiculously long strings. At its most complex, or so it seems initially, switching can mean health-bar chomping multitasking where the victim doesn't touch the ground. It's the most eye-catching aspect of Street Fighter X Tekken, and it also ends up as its Achilles' Heel. When two fighters are facing each other, poking away and looking for an opening, it plays in a similar manner to Street Fighter IV. But as soon as that first hit lands all bets are off – you could be in for a few smacks around the chops, or 30 seconds of watching your guy get battered from pillar to post without a chance of intervening. It doesn't sound like fun because it's not fun. The chaining aspect of Street Fighter X Tekken's system is implemented with a huge amount of skill, but it badly needed the brakes put on it beyond a certain stage. As it is, almost half of the online fights I have degenerate into watching my poor saps get pummelled in the corner. Rolento and Rufus are among the worst offenders, capable of turning a landed jab into an endless string of blows that regularly removes over half your health bar – and these strings are not particularly difficult to execute, which makes them incredibly common. This is not sour grapes. I'm not amazing at Street Fighter IV, but have sunk over 200 hours into it and am well-versed in the art of losing graciously. In Street Fighter X Tekken you're often just left watching a fight rather than participating in one. Everyone would accept that if an opponent breaches your defences, they should have the opportunity to deal some heavy damage – but here the skill ceiling is so low that almost every combo can end up being a huge one. This is a fighting game where you're often reduced to the status of punching bag. It's a tremendously sad misstep, because in other ways Street Fighter X Tekken is a magnificent beast. Visually it's an astounding achievement, with more detailed versions of Street Fighter IV's chunky brush-textured models alongside definitive treatments of the Tekken cast. The marquee characters are superb, and Namco are going to have a difficult time topping Capcom's Heihachi and Kazuya, never mind the sensitive transformations of characters like Hwoarang. The latter is a Tae Kwon Do expert whose style pivots on the ability to change stance in an instant, which in Street Fighter X Tekken manifests in a fluid range of combo attacks and stunning midchain switches. These characters feel worth learning, worth investing your time in. The tragedy is that the game lets them down. There are extensive singleplayer modes to practise and refine every single technique for every character, as well as an arcade mode and countless ways to customise fighters. But if the online matches aren't fun for us to play then all the tournaments, ranking points and video channels are just so much fluff. It's an impressive creation, but who cares? Don't take that to imply this is a particularly good PC version, either. Street Fighter X Tekken is, as Capcom cheerfully admit, a functionally identical port of the Xbox 360 version. Bad enough, but the 360 version was inferior to the PlayStation 3's in the first place, lacking local co-op play (in a team fighting game! ), and your five gigabyte download includes a bevvy of characters locked until Capcom graciously allow you to buy them at some point in the future. 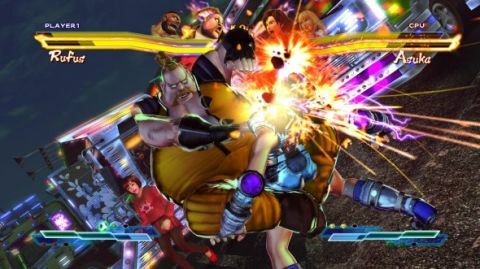 Regardless of whether Street Fighter X Tekken is the best game in the world or not, that's a scummy tactic – and Capcom's money-obsessed form with Street Fighter IV suggests there's a lot more to come. None of this would matter if the fighting was better. There are stretches of X Tekken where it seems to work perfectly, with the right combinations of characters and similarly skilled players resulting in tense standoffs where every hit counts. But it's never too long before the loading screen shows your opponent has picked Poison and Hugo, and you know before the fight starts that they've memorised these characters' simple back-and-forth chains of combos. Those low expectations are duly realised. You should be excited when a fight's starting, not resigned. It feels almost incredible to say it, but Street Fighter X Tekken is a bad game. It doesn't seem like a bad game, because everything looks amazing and in your hands the controls are fluid and punchy. But as soon as you start playing online, patterns are quickly spotted, and soon they become dominant themes. Such is the time you spend unable to influence the on-screen action that Street Fighter X Tekken just feels like a big drag. Played offline or with a mate, this is a decent scrapper. But going beyond casual play is impossible, because Street Fighter X Tekken's clearly deep combat system is riven by an all-consuming flaw that rapidly smothers your interest. This game was given an easy ride on consoles, but don't be taken in. That's not a gi Ryu's wearing – it's the emperor's new clothes.